When it comes to snacking, popcorn is not as popular as other salty and crunchy treats, such as potato chips, according to the Agricultural Marketing Resource Center. But as a whole grain, it makes a healthier snack option and may be beneficial to those trying to lose weight, as long as you're eating the better popcorn options. Consult your doctor before starting any weight-loss diet. Snacking can either help or hurt your weight loss efforts, according to a 2011 study published in the Journal of the American Dietetic Association. Snacking is not necessarily a bad thing when you're trying to lose weight, but people often make poor choices at snack time. As a whole grain, popcorn gives you a sensible, yet satisfying, choice when following a weight-loss diet. 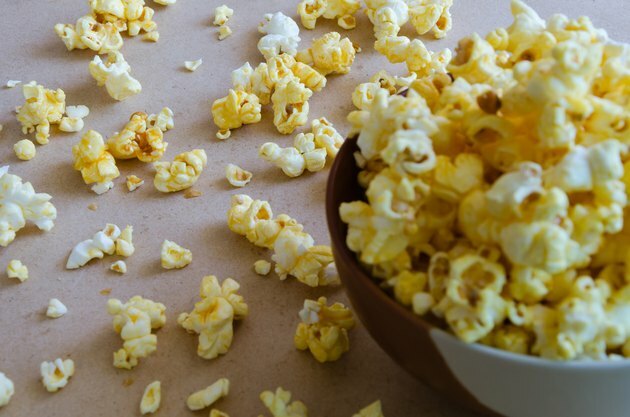 Healthy snacks like popcorn help control hunger to help prevent overeating at the next meal and up the overall nutritional quality of your diet. Some types of popcorn are much higher in calories than others. When it comes to weight loss, eating the lowest-calorie version of a food is wise. For one brand, a 1-cup serving of 94 percent fat-free microwave popcorn has 20 calories, while the same serving of kettle-corn microwave popcorn has 33 calories -- but calories range from 20 to 40 per cup depending on which brand you choose. Air-popped popcorn is a little higher in calories than the microwave fat-free varieties, with 31 calories per cup, but it's also sodium-free. Bagged popcorn calories vary, ranging from 37 calories in a cup of lightly salted popcorn to 91 calories in a cup of cheese-flavored popcorn. Like the microwave varieties, bagged popcorn is higher in sodium, and sometimes fat, than air-popped. If you're going to the movies, you may want to skip the popcorn all together. Depending on the theater, calories range from 25 calories to 60 calories per cup -- a small bag contains as much as 11 cups. Movie theater popcorn is also high in sodium and fat, even without the added butter. Popcorn is a good source of fiber, with 1 gram per cup. Fiber is a type of carbohydrate your body cannot fully digest. It adds bulk to food, which helps fill you up. Fiber also slows digestion, so you feel full longer. Adults need 21 to 38 grams of fiber a day, depending on age and gender. A 2015 study published in the Annals of Internal Medicine found that people were able to lose weight by upping their daily intake to an average of 19 grams of fiber a day. Popcorn can help you meet your daily fiber needs to promote weight loss. Snack calories should be kept low, especially when you're trying to lose weight. The Academy of Nutrition and Dietetics suggests a range of 100 calories to 300 calories for a snack. Popcorn has few calories in a large serving, which means you get a big bang for your calorie buck. Depending on the number of calories you're eating at snack time, you can have 3 to 10 cups of air-popped popcorn. Swapping out a high-calorie snack food for air-popped popcorn saves calories and helps you lose weight. For example, if you ate 3 cups of air-popped popcorn twice a week instead of 3 cups of bagged cheese-flavored popcorn. you would save 18,720 calories over the course of a year, which may help you lose more than 5 pounds. However, while popcorn is a low-calorie snack option, overdoing it and eating more calories than your body needs, no matter where they come from, will hinder your weight loss. Too much sodium in your diet may cause you to retain fluids, which may affect the numbers on the scale and lead to frustration with your weight loss efforts. To limit the temptation of salty microwave varieties of popcorn, use seasonings to flavor your air-popped popcorn. Sprinkle on a little Cajun spice for some kick, or cinnamon for a touch of sweetness. A little Parmesan cheese adds a touch of saltiness to your whole-grain snack, but with less sodium than salt. Chips vs. Popcorn: Which Is Worse? Is There a Nutritional Difference Between White & Yellow Popcorn?